1. Dr. Pawan Patni & Dr. P. K. Jain (2011), “Excellence Beyond”, published by Excel Books, New Delhi, pp 285. 2. Dr. Pramod Jain & Dr. Pawan Patni (2011), “Management of Emotions – For Managerial Effectiveness”, published in Excellence Beyond by Excel Books, New Delhi pp 3-12. 3. Rashmi Farkiya, (2011), “Rewards & Recognition of Employees: A Case Study at Grasim Industries Limited, Nagda”, published in Excellence Beyond by Excel Books, New Delhi pp 23-30. 4. Nihit Jaiswal & Himanshu Gupta (2011), “Life Insurance Advertising in India –Analysis of Recent Trends”, published in Excellence Beyond by Excel Books, New Delhi pp 146-158. 5. Himanshu Gupta & Nihit Jaiswal (2011), “Globalization and its impact on Indian Economy”, published in Excellence Beyond by Excel Books, New Delhi pp168-178. 6. Shweta Mogre, (2011), “A Comprehensive Study of Statistical Decision Theory”, published in Excellence Beyond by Excel Books, New Delhi pp 231-237. 7. Sadique Khan & Nilesh Jain, (2011), “Deconstructing XML”, published in Excellence Beyond, by Excel Books, New Delhi pp 250-254. 8. Dr. V. K. Jain (2010), Strategies for Reducing Institute-Industry GAP, published in Proceedings of National Seminar on “Quality Management in Higher Education” pp 1-7. 9. Nihit Jaiswal (2010), Demands for Skilled Human Resource, published in Proceedings of National Seminar on “Quality Management in Higher Education” pp 53-57. 10. Nihit Jaiswal (2010), Challenges in MBA, Proceedings of National Seminar on “Quality Management in Higher Education” pp 58-61. 11. Dr. P. K. Jain, Dr. Pawan Patni, CA Prashant Jain (2010), Quality Management in Higher Education, published in Proceedings of National Seminar on “Quality Management in Higher Education” pp 98-105. 12. Dr. V. K. Jain (2010), Problem & Challenges of Controller of Examination in the University, published in Proceedings of National Seminar on “Quality Management in Higher Education” pp 110-112. 13. Dr. V. K. Jain, Sumit Zokarkar (2010), published in Proceedings of National Seminar on “Quality Management in Higher Education” pp 183-189. 14. Dr. Mona Tawar, Dr. V. K. Jain (2010), An insight into Ethical Issues in Higher Education with reference to India, published in Proceedings of National Seminar on “Quality Management in Higher Education” pp 159-162. 15. 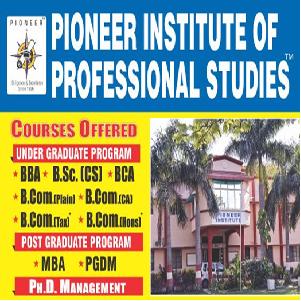 Dr. Mona Tawar, Dr. V. K. Jain (2010), Darpan: e-News Letter, Pioneer Institute of Professional Studies, Vol. 3, No. 2.